Pumpkins are having their moment in the sun. Ever since Starbucks (SBUX) introduced its famed pumpkin spice latte about a decade ago, pumpkin sales have skyrocketed. It's led to the increased popularity of pumpkin-spiced everything, including spicy pumpkin beef jerky and pumpkin beer. 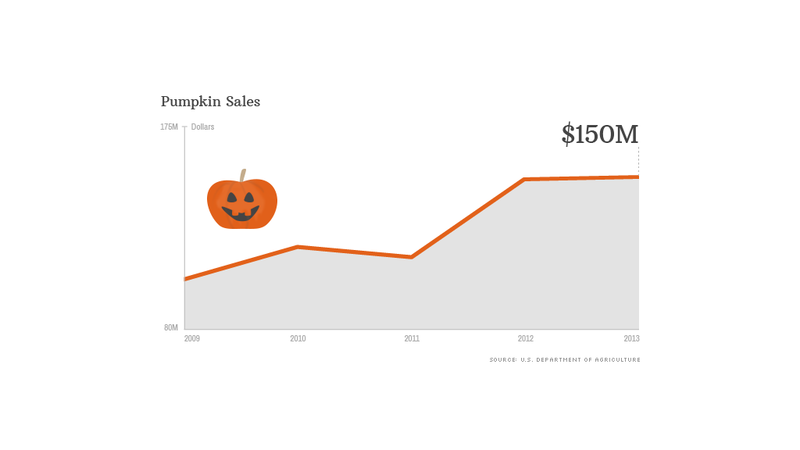 In the last five years alone, pumpkin sales have risen 34%, according to the U.S. Department of Agriculture. Ask Betsy Stuart. Sales of pumpkins have doubled in the past decade at her family farm in Granite Springs, N.Y., about an hour north of New York City. "It has helped a lot because it gets the name out there, it gets the spice out there," said Stuart, 62, about pumpkin products. "It has made real pumpkins more popular." Nationwide, pumpkins are clearly taking off: Acreage dedicated to pumpkin farming increased about a third in the last decade, according to the USDA. Take a state like Virginia. There were no pumpkin farms 15 years ago in the heavily agricultural southwest of the state. 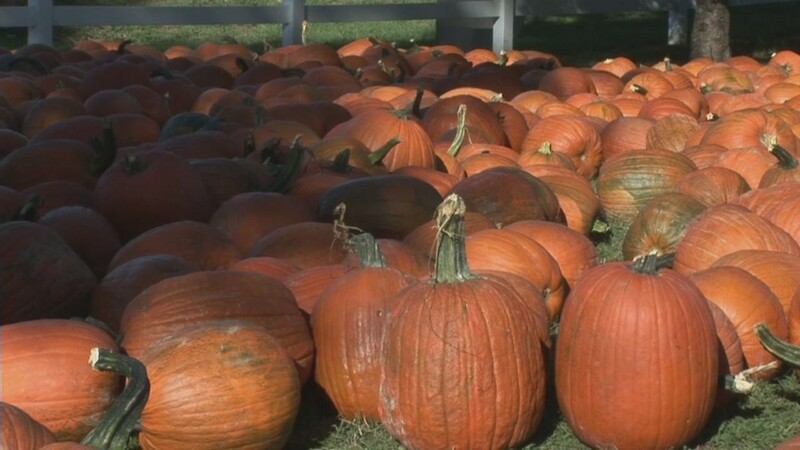 Now there's about 4,000 acres of pumpkins, according to Allen Straw, an agriculture professor at Virginia Tech University and a member of the Virginia Pumpkin Growers Association. Demand for pumpkins just keeps going up. Sales of all pumpkin-flavored foods and beverages increased 14% in 2013 compared to 2012, according to market research firm Nielsen. The "season," for pumpkin products is also extending. What used to be only a limited fall treat now starts as early as mid-July. "Starbucks created a huge craze based on their pumpkin spiced latte," said Danelle Kosmal, vice president of research for alcoholic beverages at Nielsen. "As we continue to see more and more things like the pumpkin-flavored beers and the fall seasonals hit the shelves, there's going to be more and more competition for that shelf space." Starbucks has sold over 200 million pumpkin spice lattes, the company says. Pumpkin is now mixed with other flavors: Dunkin Donuts (DNKN) and its subsidiary, Baskin Robbins, are jumping in with a pumpkin crème brulee latte and pumpkin cheesecake ice cream this fall. Jim Koch, founder of Sam Adams Beer (SAM), even touted the success of his company's two pumpkin-flavored beers last year while discussing the company's earnings. "When you walk into a liquor store now, and you see the number of pumpkin beers," said Jamie Jones, co-owner of Jones Family Farms in Shelton, Conn. "It makes your head spin. It seems like every brand has a pumpkin flavor." Jones estimates that pumpkin sales on his farm are up 25% since the pumpkin spiced latte debuted a decade ago.